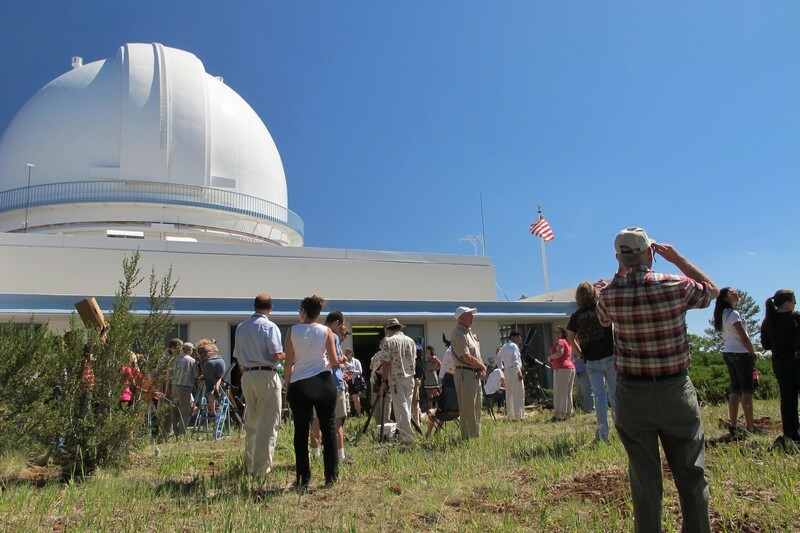 The US Naval Observatory branch in Flagstaff held an open house today and had plenty of telescopes set up with solar filters so that the public could watch the transit. We had a fantastic view. Here is a picture taken with my 400 mm lens with a huge stack of filters (2 N8s, 2 N4s and a polarizer), f/22 and 1/8000 shutter at 100 ISO – the least sensitive I could possibly make this camera. Through the viewfinder, it was still to bright to look at, and i had to guess at the focus (for some reason, a little less than infinity). It’s a little fuzzy because of the atmosphere, I think, but you can clearly see the disk of Venus. I watched it at the moment it made “contact”, but this photo was taken more than an hour later. 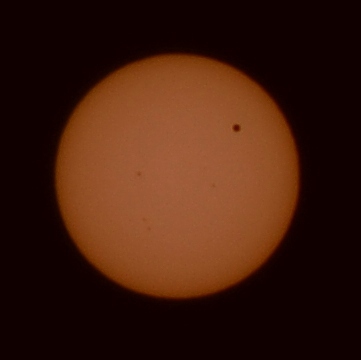 you can faintly see some sunspots.